Welcome to the first Meezer Musings of 2017! And although we're very nearly at the end of January I hope it's not too late to wish you, and your human and fur-families, a very happy New Year. We start the year by taking a look at vets and veterinary costs. 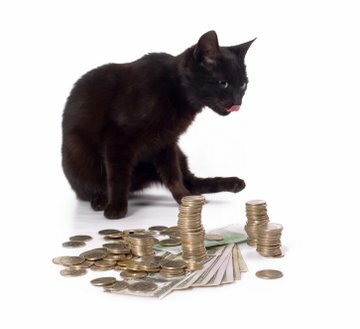 Veterinary fees are on the increase all over the world; along with medical bills, it's probably one of the fastest-rising costs anywhere. Why is this? And how can you make sure you're able to pay those bills when they arise - as they most definitely will? Can you afford to pay your vet? Why Are Vets So Costly? I'd be willing to bet that all of us are concerned, if not outright troubled, by the rising cost of veterinary care. In parallel with advances in human medicine, veterinary medicine has changed considerably in the last fifty years, as this article by Dr Karen Becker points out. Once upon a time vets used to provide fairly basic primary care services for pets but not a lot more. However treatments have become much more sophisticated and nowadays, veterinary practices are able to offer a range of specialized treatments including blood tests and complex surgical procedures, as well as x-rays, ultrasound, CT, and MRI scans. Even if they don't provide all of these facilities in their own clinics, chances are they'll be able to refer you on to an animal hospital that does. Vets need to be skilled diagnosticians, surgeons, emergency medicine experts and a lot more besides and their long veterinary training doesn't come cheap. Neither do the buildings, equipment, drugs and staff needed to maintain and run a modern veterinary practice. And all of these costs are passed on to us. I sometimes think that if I'd known, nine years ago, how much I'd end up paying in veterinary costs over the years, I might never have adopted Bandit. Most people would pay anything, do anything (including going without food themselves) to ensure their pets are healthy and pain-free but even in the best-regulated life, crises such as illness, job loss, divorce or the need to pay urgent, unexpected bills mean that there's no money left over to pay for veterinary treatment when it's needed. In one of the cat groups I belong to, I recently read a comment from someone who said that if they could have their time with their cat over again, the one thing they'd do from Day 1 would be to set up pet insurance. Whether or not to take out insurance can be a difficult decision to make, as no-one wants to pay out a lot of money if treatment isn't going to be needed. However, it's almost certain that at some stage in your pet's life, treatment will be needed, and the advantage of having pet insurance is that it can help to pay major, unexpected bills. On the minus side, pet insurance doesn't cover routine visits like annual vaccinations, check-ups, dental cleaning or neutering/spaying. And insurance premiums and any excess (the amount you must pay yourself, before you receive an insurance payout) both rise with age, so as your cat gets older, you have to spend more before receiving any insurance benefit, just at the time when your cat is going to need it most. What Kinds of Pet Insurance Are There? How do you decide what sort of insurance to take out? It can all be a bit of a minefield! Different insurance companies will have different policies, but there are generally three types. Cover is provided for veterinary fees annually, up to a set amount. As long as you renew the policy every year without a break, there's no time limit on how long you can claim for any particular illness. This type of policy is ideal for ongoing conditions - diabetes, for example, or kidney disease. This means that you can claim for the condition in Year 1, and then again for that same condition in Years, 2, 3, 4 etc. as long as your cover is unbroken. Cover is provided up to a maximum amount per condition. There's a time-limit (generally twelve months) which means that any one condition will only be covered for that amount of time. After twelve months, that condition will be excluded from the policy. Cover is provided up to a maximum amount per condition. This is not limited by time, but once you've claimed up to the maximum for a condition, that condition is then excluded from the policy. If you don't want, or can't afford to take out pet insurance, an alternative is to set up a savings account of your own that's kept purely to pay vet bills as they arise. however much you put in, you may not save enough for the high cost of major surgery, or to cover a long-term illness needing ongoing treatment. Some vets have their own 'savings plans' which allow you to pay a monthly fee towards the cost of routine treatments, so it's worth checking this out, too. I'm occasionally contacted for help by readers who can't afford to pay big vet bills in what are very often life-or-death situations, and no-one wants their cat to suffer or go without necessary treatment through lack of money. So if this ever happens to you or anyone you know, here are a few ideas. First and easiest - start by asking your own vet if they'll allow you to pay off your bill in monthly amounts. Some do, some don't. If they don't, applying for CareCredit, a credit card that allows you to pay for both human and pet health care through staged payments, might be an option. In the USA, the Humane Society of the United States has a comprehensive list of places providing financial assistance to pet owners in need - these include listings by state, so you can easily find the resources closest to you. In the UK, the animal charities the PDSA and Blue Cross could be places to start. And in the days of social media and crowdfunding, setting up a request for donations on a site like GoFundMe might be a way to go. If you have any other ideas, or know of any similar resources where you live, please send me a message to let me know about them, and I'll add them to our list. 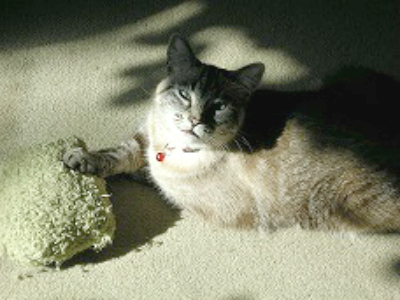 Our Meezer of the Month for January is lynx point Sasha, from beautiful British Columbia in Canada. You can read Sasha's full story here - thanks Susan for sharing Sasha with us! A Siamese Cat Book With a Difference! At some point over the Christmas holidays I came across a children's book called Growing Up in Ecuador. I can't remember now quite how I found it, but with a Siamese cat in it, of course I had to read it! The book tells the true story of a boy, Jonny (Jonathan Nobel, shown on the cover) and the years he spent with his parents in Ecuador before the family's eventual return to America. 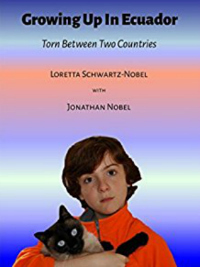 Co-written by Jonny and his mother, Loretta Schwartz-Nobel, herself a writer, and told by Jonny in his own words, the story revolves around a Siamese kitten Jonny finds for sale in a market and names Sky, and Jonny's relationships with Sky and his best friend Ishmael. Sky proves to be something of a savior for Jonny, who forms a strong bond (as so many of us do!) with his beautiful Siamese cat. Sprinkled with photos from Jonny's life and aimed at children aged 6-10 (but suitable for everyone - I thoroughly enjoyed it!) Growing up in Ecuador can be found on Amazon either as a paperback or Kindle version. Regular visitors to this website will know that we accept stories written by readers about their own cats themed around rescue, or behavior, or memorials to much-loved members of the family. Over time these stories have become quite numerous and need re-arranging so this is what I'll be focusing on over the next couple of months. Because of this the submission form for stories is closed at the moment, and there may be some disruption as stories are moved around to make their location more logical. So please excuse our dust while renovations are in progress! Our Fun from Facebook photo this month is of a little rescue cat called Piggy. Abandoned by her mother, she was rescued at only one day old - taken in and bottle-fed by Echo Kring and her family. The family's dachshund had puppies soon after Piggy was born, and accepted the kitten as one of her pups - even to the extent of nursing her. 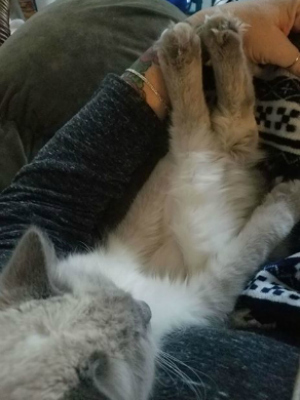 Piggy is still a tiny cat - she'll be one year old on February 3rd, but her parents were both seal point Siamese. She is bipolar and a total pig when she eats - which is why her name is Piggy! Having been brought up by humans (and a dog) she clearly thinks she's a little human too! That's all from us for January - we'll be back towards the end of February and in the mean time we hope you have a very happy month.